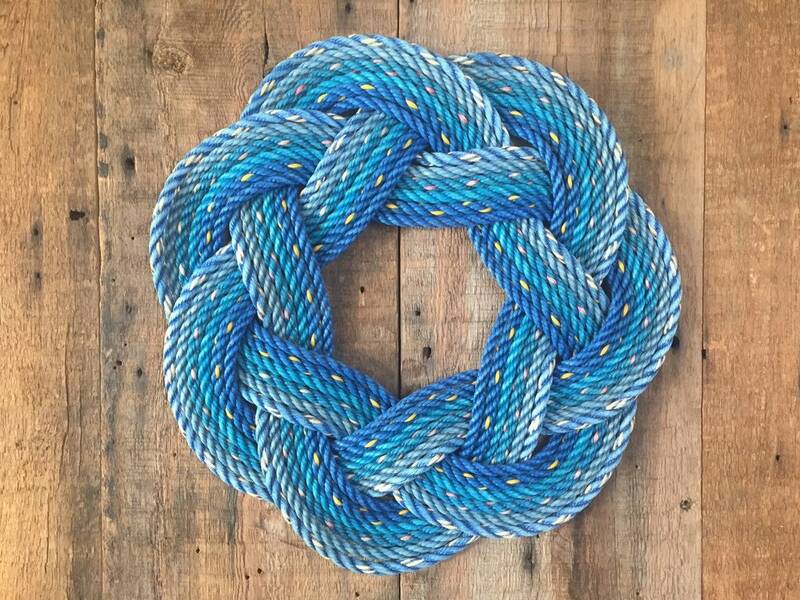 The Turk's head knot wreath is hand woven using 3/8" multi-colored lines that are neatly joined together to create a single strand. This wreath has an outside diameter of approximately 17". The rope colors are 6 shades of blue are with red, yellow and white tracers. Just beautiful. Love the colors in this wreath !! I purchased a total of 3 and this one I'm keeping as a gift for myself! The ombre color combo is beautiful and I plan on hanging it on my new red door once it's installed. This is definitely a unique wreath that also embraces repurposing. Thank you for such a cool creation! Arrived quickly. Colors true to photo. Roping seemed clean but worn which gives it a nice rustic touch and SO COOL THAT IT IS UPCYCLED!